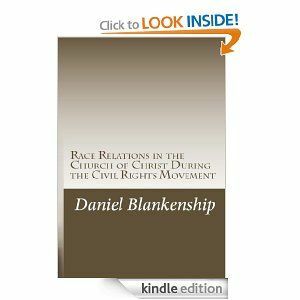 I just finished reading a short book by Daniel Blankeship that I encourage you to read. It’s lengthy title is Race Relations in the Church of Christ During the Civil Rights Movement. Daniel does a good job of describing the racial tensions endemic within churches of Christ in the 1960’s. The book was first written as a course requirement at Harding School of Theology. As a consequence it is well footnoted and has a helpful bibliography for anyone wanting to study the topic further. As I read the book I kept asking myself, “How does this historical information impact me now?” The answer I came up with revolves around reconciliation. Many white Christians believed their duty to the black church was to provide them with finances for a building, yet few white Christians desired authentic relationships with their black brethren. Perhaps providing a building to the black Christians was a way of segregating the church in an non-threatening way. Whites could claim to abhor racial prejudice and offer [financial] support to black churches, preachers and schools, even while maintaining segregated colleges in the South and generally ignoring the discrimination against blacks in economics, education, politics and social customs. White churches made sure that their black brothers ans sisters had separate places to worship. When Christians and whole churches deny that racial tension has ever been a significant issue among Churches of Christ they are incapable of taking the first step toward reconciliation. Just as our eternal salvation requires repentance for sin so that we can reconcile with God, personal and racial reconciliation also begins with confession and repentance. I highlight these universities because, as Blankenship demonstrates, for so long they stood as icons for the racial segregation and discrimination that existed among churches. Their steps to reconcile with the black churches provide an important model for congregations around the country. I don’t know that each and every congregation must have a special event to apologise to their African-American community for actions taken in the 1960’s. However churches must have enough familiarity with their own history and the history of Churches of Christ in general to acknowledge injustice when appropriate. The “appropriate” time may be in personal conversations, or during decision making processes, or maybe just slipped into a sermon from time to time. Pretending the Churches of Christ have never had any problems between racial groups is simply not an option. I encourage you to take an hour and read Daniel’s book. It’s a good introduction to the historical issues confronting the church. For $5 how can you go wrong? You can purchase it HERE. If you’re looking for a more complete study of the topic then Wes Crawford’s book “Shattering the Illusion“, might help you out. This is the fifth and final post discussing a five stage continuum of growing cross-cultural competence that Mark DeYmaz describes in his book, Building a Healthy Multi-Ethnic Church. He calls this destination stage “Cultural Competence”. We should not confuse Cultural Competence with expertise. DeYmaz describes Culturally Competent people as “individuals who value diversity, conduct self-assessment, manage the dynamics of difference, acquire and institutionalize cultural knowledge and are able to adapt to diversity and the cultural contexts of the communities they serve.” (105) That’s quite a mouth full. This definition becomes clearer when we contrast it with the previous stage, Cultural Sensitivity. Sensitivity emphasises asking the right questions. Competence has learned the answers to the question and now does something about it. Notice the action words in the above definition: Value, conduct, manage, acquire and institutionalize, and adapt. The Culturally Competent person still continues to ask questions and explore different cultures. This person remembers previous lessons, avoids the pitfalls and uses their inquiries to benefit others of that culture. One personal example of obtaining Cultural Competence involves football. Coming to the United States in 1999 I was aware of “gridiron”, but had zero understanding. Over time I asked questions and listened to sports talk radio. I selected a team to support and participated in conversations with American fans. I still know more about Australian football than American, but I have reached a level of competence so that I can blog about American sports, including NFL. What areas of church life require us to pursue Cultural Competence? Of course, individual relationships are the most important, but many other areas of congregational life present opportunities for cultural misunderstandings. The worship service can potentially project the values of inclusion and acceptance by the people involved in public responsibilities. A variety of musical styles communicates openness to diverse cultures. Less obvious ministry opportunities to demonstrate Cultural Competence include church meals and the nursery. If the church fellowship team prepares a menu for each church meal that is monocultural some members and guests will feel overlooked. While chicken and mashed potatoes may be staples in one cultural setting, others long for various beans and even different meats. Drinks also present a challenge not only between coffee and hot tea, but in a variety of cold drink preferences. Then consider the nursery. As the parent of a 4 year old I’m aware of many different parenting approaches just within my white middle class community. Are Hispanic or Asian parents as willing to drop their children off at the nursery as White or African-American parents? Do different racial groups have different behavioural expectations for their children in the nursery? How can these differences be accommodated? How do these differences impact the scheduling and training of nursery volunteers? These cultural distinctions are not limited to racial differences but could also be relevant between urban and suburban families. When churches can navigate these potentially troubled waters there’s a great likelihood that they’ve achieved Cultural Competence. At least in those areas of church life. This isthe fourth post discussing a five stage continuum of growing cross-cultural competence that Mark DeYmaz describes in his book, Building a Healthy Multi-Ethnic Church. He calls this fourth stage “Cultural Sensitivity”. If you’re reading this blog you’re probably already on the path to cultural sensitivity. Not because you’re learning from the most sensitive person in the world. I’m not. But because you’re making the effort to learn more about the subject. Hopefully you’re just as willing to learn more about other cultures you encounter in your church and community. Many people practice cultural sensitivity when we travel overseas. In 1958 an influential fictional book was published with the title The Ugly American. It described a sensitive and insensitive approaches to interacting with locals in foreign countries. In time the phrase has often been associated with American tourists. However, tourists from all countries run the risk of being “ugly” when insensitive to local customs and values. Most people I know when preparing for international travel take time to research the culture of their destination. Internet articles and numerous travel guides alert travelers to possible local sensitivities. Other people I know make an effort to speak to friends who’ve already traveled to those places and learn from their experiences. But surely if I’m attending church with people who grew up in the same city as I did, I don’t need a “travel guide” to understand them! For several months I attended the church where Phil Robertson is an elder. I respect him, his family and the church. However, his comments in a GQ article regarding African-Americans that he observed prior to desegregation in the South demonstrated a lack of cultural sensitivity. He seems to assume that what he saw reflected the hearts of the people. Practicing cultural sensitivity requires sitting down with those same people and saying, “I saw this and this on the news. How does it affect you?” Or maybe asking “Do you feel that our laws treat you as a lesser human being?” Without those conversations and efforts to understand those from another culture we’re never going to be sensitive to the thoughts and hearts of others. Pursuing cultural sensitivity requires that we seek more than the facts regarding a culture, a race, or an historical event. True sensitivity demands that we seek to glimpse the feelings and heart of people with different experiences and values than ours. Churches can promote the pursuit of sensitivity through organised events where different cultures exchange perspectives on various events. However, this does involve a risk of debating or comparing values. The most effective way for churches to embrace diverse ethnicities is for leaders to model the practice of cultural sensitivity one-on-one. These leaders will find themselves better equipped to lead the congregation along the multi-ethnic journey toward Cultural Competence. The need for cultural education isn’t limited to when we travel. Too often we assume everyone sees the world the way we do. We need to pursue cultural sensitivity each time we engage people from a different cultural background to ourselves. Since loving our neighbour requires us to express that love in a way that is meaningful to them, we have a responsibility to first learn “what is meaningful to them”. This is my third post discussing a five stage continuum of growing cross-cultural competence that Mark DeYmaz describes in his book, Building a Healthy Multi-Ethnic Church. He calls this third stage “Cultural Awareness”. Cultural Awareness occurs when a person recognises and accepts cultural distinctives. To reach this point one crosses a tipping point away from the previous stage of Cultural Blindness. Once a person accepts that culture runs much deeper than the skin and actually makes up a large part of a persons identity they can no longer deny that cultural differences exist. Churches positioned in the stage of Cultural Awareness will find themselves talking about their diversity. They will also take steps to address obvious cultural issues such as providing sign language interpretation for deaf members. Decorations and art around the church building may reflect racial diversity. Signs and announcements may be printed in multiple languages. The church might even provide English as a Second Language classes. DeYmaz describes how Mosaic church has hung flags in their worship area to “communicate no only our awareness but also our appreciation for the individuals and nations represented in our body at any given time.” (104) This makes a public statement that other nationalities and cultures are wanted and welcome at the church. My observation of this stage is that churches and individuals willingly make adjustments to accommodate differences they observe with people of another race or culture. This stage cannot be the final destination on the journey of cultural awareness. Although it has crossed a tipping point it still deals mostly with surface issues and observed needs. At this stage understanding intangible cultural values is not a priority. Although a church service might be bilingual, the attitude toward time and punctuality may still reflect the values of the majority group. A casual attitude toward punctuality on the part of the minority may be generally regarded as disrespectful and rude. Cultural Awareness does not necessarily lead one to seek understanding of other cultures. The word “awareness” is key to this definition. People recognise differences, but probably can’t explain the differences or the heart issues and values of the other culture. At this stage a person might acknowledge the fact that racial discrimination occurs, but not sit down with a man or woman of colour and ask them to describe the feelings that come with being discriminated against. If your church is at a place of Cultural Awareness, celebrate that perspective! This is the starting point for a positive dialogue. From this point growth is possible without requiring a new worldview. But don’t sit back as though this is the destination. Encourage your church to explore cultural issues. Take the first step yourself. Whether your part of a majority or minority, take some time to sit down with someone and compare cultural notes. Find someone you trust and ask them questions you’re nervous to ask publicly. Don’t think you’ve arrived because you can list those differences. Make an effort to understand the reason for differences. This is my second post discussing a five stage continuum of growing cross-cultural competence that Mark DeYmaz describes in his book, Building a Healthy Multi-Ethnic Church. He calls his second stage “Cultural Blindness”. While stage one actively promotes destruction of other cultures, stage two takes a much more subtle approach. While stage one should never be valued within a church, many churches seem to pursue stage two as a desirable goal. The cunning danger of cultural blindness is that this attitude feeds off words like “equality”. Those who adopt this definition of equality don’t realise that that they actually dehumanise all people. They devalue the unique experiences and values of diverse cultural, ethnic, racial groups and fit them all into a single “human” mold. Strangely that single mold often looks like the person or group making the statement. When I see people I don’t see colour, I just see people. We’re all Christians, let’s focus on what we have in common. I’m thankful that the congregation I currently serve does celebrate Harmony Sunday each year. If we say we see people, but not colour then we’re really not seeing people. If you tell me you know me well and you love me, but you want to ignore the fact that I’m an Australian then you’re ignoring a large part of who I am. You’re ignoring the way I pronounce words, the words I use, the sports that I value most, summers at the beach, a love of lamb meat. Instead, you project on me your likes and dislikes on the basis that we’re both human. Then I lived with some international friends who had several conversations about whether or not they could balance to squat on a raised toilet as they were accustomed to squatting on the lower toilets in their home country. A person might say they don’t see colour, but there’s a good chance they’ll see footprints on the toilet seat and not be happy about it! It’s much healthier to recognise and discuss cultural distinctions than pretend they don’t exist while complaining or fighting about them. Then there’s those Christians who quote verses like 1 Corinthians 12:13 “For we were all baptized by one Spirit so as to form one body—whether Jews or Gentiles, slave or free—and we were all given the one Spirit to drink.” They then use this to argue for a Christian culture subsumes other human cultures. That wasn’t very helpful and made me feel a bit stupid. Yes, Christians have an enormous amount in common with one another. In fact, it’s the presence of the Spirit of God within in us that motivates us to overcome our cultural differences to work together and honour God as a unified body. But the worship at a Chinese church is never going to look like a worship service at a predominantly black church. That difference is culture. While it’s tempting to pretend that racial and ethnic differences are only skin deep, it’s crucial for church leaders to encourage our members to pursue understanding, not ignorance. I hope that this first stage is never present in a church. DeYmaz includes a quote that at this level “the emphasis is on using differences as barriers.” People with this mindset acknowledge only one way of being and intentionally seek to subdue and eradicate other cultures. Examples given of this stage of cultural competence include the ethnic atrocities arising in Nazi Germany, Rwanda, Bosnia, Darfur. Attempts to “reform” native cultures in the United States by forcing Native Americans to Westernise and the tragedy of the Stolen Generation in Australia also fall under this heading. The goal of multi-ethnic churches is to respect all cultures, not force all cultures to dissolve into the dominant culture of the church. So while Cultural Destructiveness is never (should never be) a goal of the church, it remains a great fear that hangs over race relations within the church. Australian’s love to watch American movies and TV shows. There’s a lot of them. Some of them are great. Some connect with niche audiences. They generally have high production values and talented writers and actors. What’s not to like? This movie raises some of the issues in the Australia – US relationship. I thought it was very well done. In contrast films made in Australia telling Australian stories have much smaller budgets. The writers and actors do a terrific job, but the movies always seem to lack the Hollywood glitz. Australia doesn’t have super spy agencies. Australia doesn’t have the super glamourous rich and famous segment of society. Basically, Australia just lacks the same “cool factor” that American movies seem to ooze. As a result less people watch them. That’s simply the market realities. There is no secret US plot to take over Australia and suppress Australian stories and destroy the Aussie culture. (or is there???) But when kids who need the police in an emergency dial 911 instead of the Australian emergency number 000, the influence is undeniable. Aussies then become defensive toward Americans as a way of protecting their cultural identity and independence. Can you picture this same process taking place in a church setting? While teaching English to immigrants can provide a valuable service to that community, if immigrants are expected to always speak in English in the church they will always be outsiders. If the church doesn’t support the learning of the parent languages among 2nd generations, it may appear that the church is on a mission to Anglicise and Westernise all immigrants as much as it is to worship God. If US churches make a big deal of Independence Day celebrations, but fail to acknowledge Martin Luther King Day, or Chinese New Year they silently make the statement that only one culture is important. Sometimes churches feel good because their Chinese members celebrate the Lunar New Year together and it’s on the church calendar, but no one really expects the whole church to attend. Yet for the Labor Day picnic the entire church body is expected to be in attendance (including the Chinese members). Churches and individual Christians need to make the conscious decision that we will not only love and embrace people from other races and cultures, we we will also do our best to welcome their culture. One way we will demonstrate our love is by expressing interest and value in the customs of cultures we don’t know well. Mike Price is the minister at the Bogalusa Church of Christ in Louisiana. He introduces himself further below. This is his first contribution to Cultural Mosaic. You can browse more of his writing on his personal blog, http://drmikeprice.com/. Sometimes you really find a treasure. They are the unexpected events that exceed your expectations. Like taking a stroll on the beach and finding an old coin. A real surprise! On top of that you find out the coin is valuable! Just over four years ago my wife Nancy and I decided to go back into the mission work. It is a stateside mission work in Bogalusa, Louisiana. It is truly different from the foreign mission work we experienced in Kowloon, China for 3 years, where my daughter was born and we worked only with Chinese. Bogalusa is a multicultural/multiethnic mission work, consisting of 51% black, 47% white and 2% Hispanic. An interesting side note is that the demographics of Bogalusa are an identical match with the church I work with. As a result of this setting I have read and researched a lot of material on multicultural/multiethnic congregational life. I am familiar with mixed communities, because in my first twelve years of schooling I attended 12 different schools. Sometimes I attended as many as three different schools in one year and I lived in more than one mixed neighborhood. Our first preaching job while supporting myself in school was with and all black congregation and was a great experience indeed! In my preaching life most of the gospel meetings I have conducted have been for black congregations. This has not happened out of any design, it has just worked out that way. God has blessed me, and continues to do so, with a variety of experiences and challenges in life. Even with my past and present experience I need to make sure as a missionary and minister, that I am able to promote and encourage a culture in the congregation that is not dominated by any one culture or ethnic group. We need a balanced culture from God’s prospective that reflects the multicultural/multiethnic reality of our congregation. This is easier said than done, but it is taking place and continuing to improve. We are establishing a single congregational culture and practice that honors all groups represented. This goal has provided my motivation to research and gain God’s perspective for his church in a changing multicultural/ multiethinic congregation. Our nation is fast becoming a multicultural/multiethinic society, moving in a direction where there will not be one dominate culture or ethnic group. Peter Horne introduced me to a list of books on the subject and I asked Lawrence Rodgers who is working in multicultural congregation, which book he would like to see a book report on and he picked “Many Colors.” To my surprise “Many Colors” by Dr. Soong-Chan Rah, was like finding a valuable coin while taking a stroll down the beach and being totally surprised. It sums up so well and with clarity, what I have experienced and lived through. Rah also gives me more information to work with, which will allow me to become a better minister for Christ – increasing my cultural intelligence. The book is written in a way that anyone who reads it can digest the information and intent of the book. Soong-Chan Rah, points out that culture may operate on three levels which reinforces what and where we are culturally. I hope you will take the time to read “Many Colors,” it will bless your life! Whether you are in a multicultural/ multiethnic congregation or not, “Many Colors” will open up avenues of success in your own personal evangelism and capacity to reach out to a truly multicultural/multiethinic nation that we are becoming, increasing your cultural intelligence.